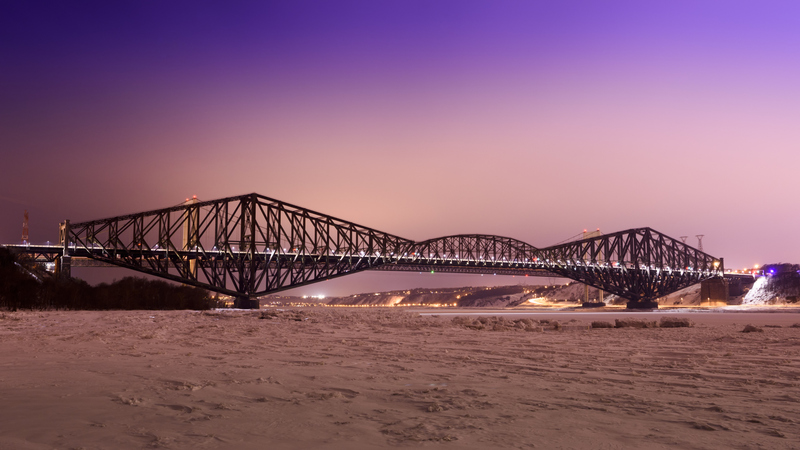 Quebec Bridge – Pont de Quebec with ice covered Saint Lawrence River. Gerber Girders, or cantilever girders, have been one of the most widely used structural framing systems throughout the world. Primarily used during the 19th and 20th centuries for bridges (Figure 1), they were soon adopted into building structures as primary or secondary framing. However, since the 1980s there have been numerous failures of structures with Gerber Girder framing. Investigations of these failures shed light on the fact that the building codes and design standards prior to 1989 were not adequate. Consequently, it is important for forensic engineers now to be able to identify this framing system in any structure and provide restoration solutions based on updated codes, if required by the findings. This article provides a brief overview of the structural steel Gerber Girder System, examples of well-documented failures of this system, structural issues that resulted in these failures, and updated provisions in building codes and standards issued to ensure safety of cantilever girder structures as an outcome of these failures. Gottfried Heinrich Gerber invented the Gerber Girder System in the 19th century. It is also referred to as the cantilever-suspended span girder and primarily consists of two members — the cantilever girder and the suspended girder. This system is arranged in such a way that the cantilever girder “cantilevers” over the column supports, connected to the girder through a base plate, with the ends supporting the suspended spans through shear connections. The basic idea behind this system is to create a statically determinate structure by introducing hinges in a continuous beam, which are located strategically to produce a structurally stable configuration as well as an even distribution of girder design moments under uniform loading (Figure 2). Figure 2: Strategically placed hinges produce an even distribution of girder design moments under uniform loading. Popularity of the Gerber Girder System can be attributed to its cost effectiveness, as it involves simple and repeated framing for relatively uniform loading. This system also has the advantage of both simply supported beams and continuous beams, making it relatively easy to analytically determine the bending moments by hand calculations. 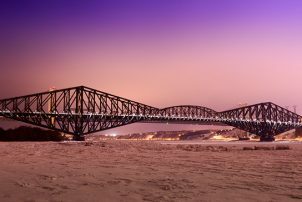 The maximum positive and negative moments get distributed over mid-spans and supports, thereby producing lower total stresses than that in similar structural framing configurations with simply supported beams. Though this system is still currently being used for the new design of bridge structures, it has become a lapsed system for building framing due to the development of structural analysis software making the design of structurally indeterminate structures easy and economical. Since the early 1980s, until recently, there have been several failures of steel frame buildings that utilize the Gerber Girder System with open web steel joist (OWSJ) framing. Two examples of this failure are the Station Square collapse in Burnaby, Canada (Figure 3) and a more recent warehouse partial roof framing collapse of a warehouse in Texas. 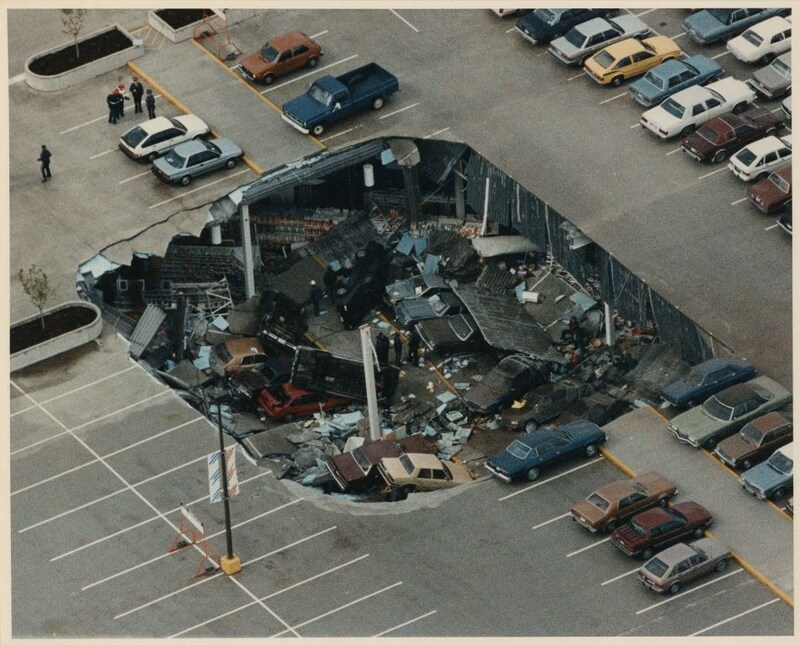 Figure 3: The Station Square collapse in 1988 involved four bays of a supermarket and roof parking facility. The Station Square collapse in 1988 is one of the most well-documented failures relating to the Gerber Girder System. Four bays of a supermarket and rooftop parking facility collapsed causing property damage. The failure was attributed to the roof Gerber Girder System’s inability to hold the weight of the parking deck and the automobiles above. The modes of failure, as reported by the Project Commissioner Inquiry, were caused by buckling of the girder-column assembly and lateral torsional buckling of the girder at the location above the support, causing one of the girders to rotate. It was found also that the girder-column assemblies lacked essential lateral supports, which contributed to the failure. In 2011, three bays of a warehouse in Texas collapsed; the failure was similar to the one at the Station Square. The partial roof collapse was primarily due to structural instability of the girders and columns of the girder-column joint assembly (Figure 4). 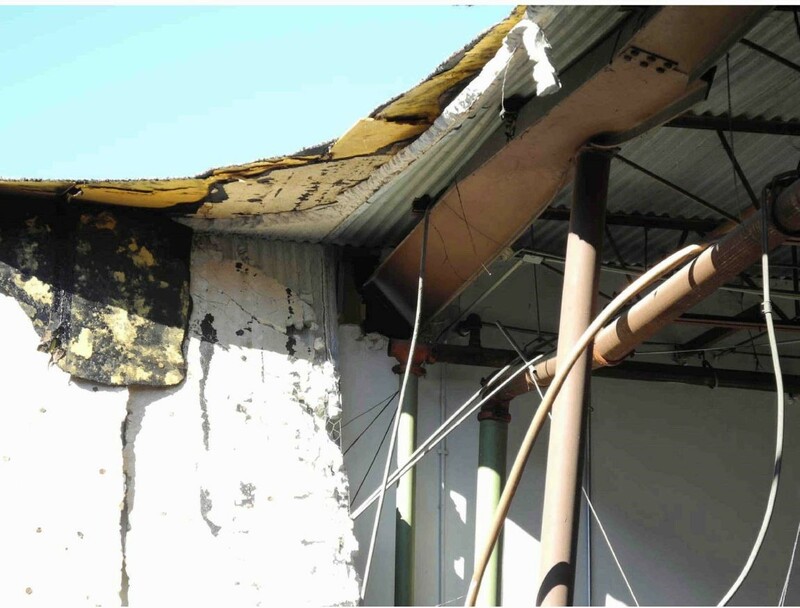 This structural instability was caused by deficient roof framing design of the warehouse. The failures included localized girder web and flange deformation at the support, rotation of girder about the longitudinal axis, and out-of-plumb columns. Figure 4: Failed girder-column connection, girder lateral torsional buckling, and local failure at a warehouse in Texas. Through thorough investigations of these collapses, it was determined that most of the failures occurred due to the lack of lateral support at the top of the column and lateral torsional support to the girders. 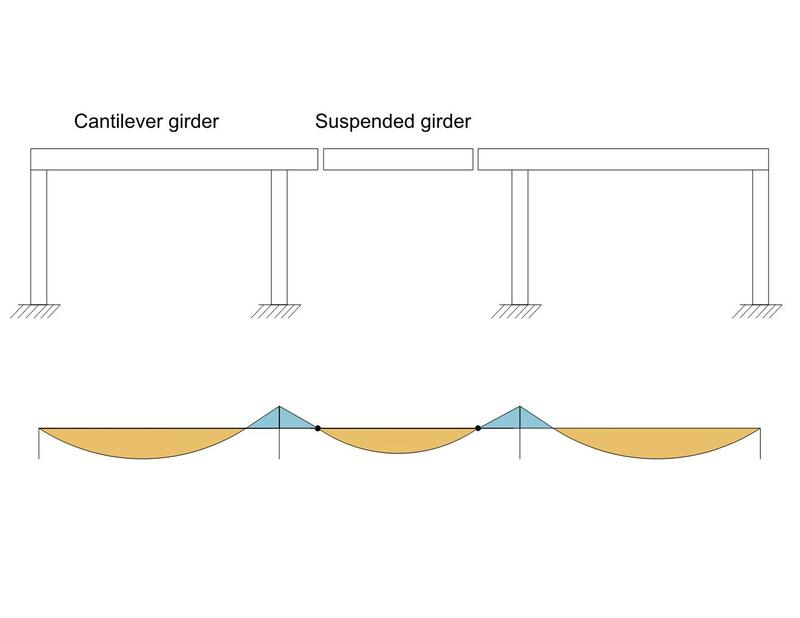 This points out that a critical design factor that needs to be satisfied in a Gerber Girder configuration is stability of the girder-column connection. Because of the structural instability of these Gerber Girders used with OWSJ in buildings, their behavior is highly unpredictable, and failure can occur even in the absence of any significant loading. These and other documented structural failures triggered professional technical societies and other organizations to identify specific structural concerns and update the provisions and specifications accordingly. Following are the industry standards that were modified as a result of the Gerber Girder failure prior to 1989. Canadian Institute of Steel Construction (CISC) — Subsequent to various collapses of floor and roof framing systems utilizing the cantilever girder system in the 1980s, CISC published Roof Framing with Cantilever (Gerber) Girders & Open Web Steel Joists in 1989 that identifies specific structural concerns regarding this framing system. This standard defines the instability condition in a Gerber System as absence of girder web stiffeners and lateral bracing at the top of the column in the column-girder joint. This publication suggests the girder-column joint assembly to be well examined to ensure girder cross sectional stability, as well as girder and column lateral stability. It also provides design solutions for achieving the stability of the system by providing girder web stiffeners over the supports to prevent local instabilities (web crippling, web buckling, etc.) and joist bottom chord extension to ensure lateral support to the column as well as lateral torsional support to the girder. This was the first publication that addressed the Gerber Girder structural instability condition. Structural Stability Research Council — This professional organization described the instability condition in girder-column joint assembly in its Fifth Edition of Guide to Stability Design for Metal Structures. Section 12.11 advised that a brace needs to be provided at the bottom flange of the girder, bottom chord extension at the top of the column, and that use of web stiffeners in the girder at the column location may also be effective under certain conditions. American Institute of Steel Construction (AISC) — Specification for Structural Steel Buildings AISC 360 Standard includes provisions that apply to the cantilever girder systems in 2016, Fifteenth Edition. The provisions for stability bracing are noted in Part 2 General Design Considerations. AISC suggests that the girder-column joint should be considered as a brace point for both cantilever beam and the column top for stability purposes. It advises the use of joist bottom chord extensions to the top of the column to ensure stability. In the event that the use of bottom chord extensions cannot be accommodated, it advises the use of diagonal bracing, with strength and stiffness requirements being satisfied according to AISC Specification Appendix 6. An alternative to provide required stability to the system utilizes stiffeners in the beam web along with moment connection between the column top and beam bottom. This also ensures proper alignment of the girder-column assembly. In any case, AISC requires that the assembly must meet the requirements of AISC Specification J10, which ensures local stability like web local yielding, flange local bending, etc. As mentioned above, changes in the steel codes to correct the Gerber Girder design deficiencies did not take effect until 1989. However, there are steel structures built prior to 1989 in service today with this lateral instability condition that should be identified and corrected before any additional damages can occur. Based on lessons learned from these failures, it is evident that the key to the Gerber Girder System working properly is to use appropriate rotational restraint at the girder-column connections. 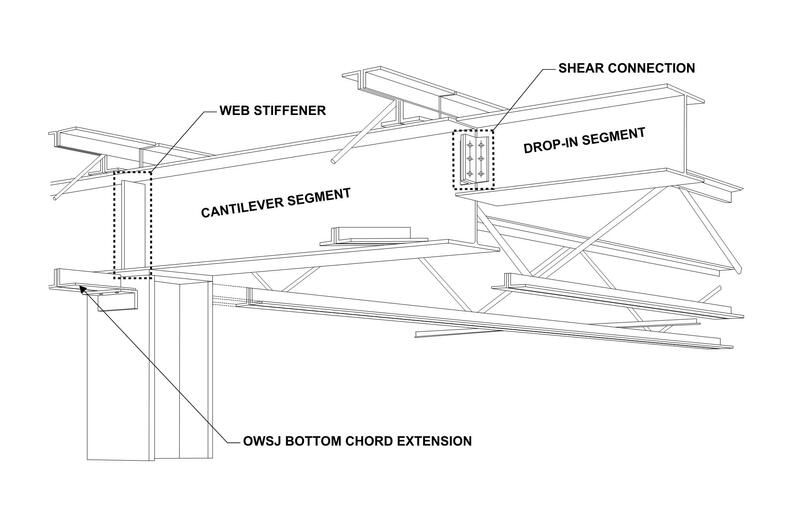 Option 1 — Use of plate stiffeners in the girder webs at the column support locations. These stiffener plates are required to prevent girder web instabilities, such as web sideways, web crippling, and web compression buckling. Figure 5: A Gerber Girder should be restrained from rotating or twisting about its longitudinal axis at the column support locations. It is important for structural forensic engineers to be aware of the Gerber Girder deficiencies and be able to identify these defective structures. A structural forensic investigation should be performed to evaluate a structure’s stability, and required repair design and documentation should be provided according to current code provisions. Current owners and potential buyers of structural steel buildings should engage the services of qualified structural engineers to evaluate their properties for OWSJ framing and determine if the Gerber Girder structural instability condition is present. Lakshmi M. Vemuri, EIT, is a structural engineer II at Walker Consultants specializing in restoration of structures. She has successfully worked on many concrete- and steel-related building restoration projects. Alfredo E. Bustamante, P.E., CDT, a principal and director of Forensic Restoration at Walker Consultants, has more than 17 years of experience as a project manager in a variety of structural, architectural, and material distress-related projects. His experience includes evaluation, design, and construction phase services of many building exterior wall repair projects. This article was originally published in Civil + Structural Engineer.